When The Walking Dead first hit comic book shelves in 2003, nobody could have predicted the cultural impact that it would have for years to come. The story was an inventive re-imagining of the "zombie" mythos told over stunning black-and-white artwork and taking place in recognizable locals in the not-so-distant future. Rick Grimes, the tortured protagonist of these stories, is both the every-man and the hero. His story and the stories of those he comes across in his travels is compelling, entertaining, and thought-provoking. The stories are so compelling that they have inspired two television shows, several console and mobile video games, novels, and countless collectibles and memorabilia. To help you sort through the worthwhile collectibles, we have compiled this list of popular The Walking Dead merchandise. For the sake of organization, we are excluding knick-knack items, but rest assured that among the many items licensed for The Walking Dead you can find pint glasses, lunch boxes, key chains, wallets, T-shirts, stickers, Christmas tree ornaments, cardboard cutouts, Halloween costumes, backpacks, board games, and just about anything else you can imagine. The popularity of The Walking Dead is so widespread that Target stores across America now have a considerable amount of shelf space devoted solely to the franchise's many licensed products. In fact, some of the items on this list can be found at large retailers and may be a good place to kick off your own collection. Broken into several groups of collectibles, follow the main headings and images to shop on eBay. The linked text in the body of each section takes you directly to detailed profiles or articles on the site. 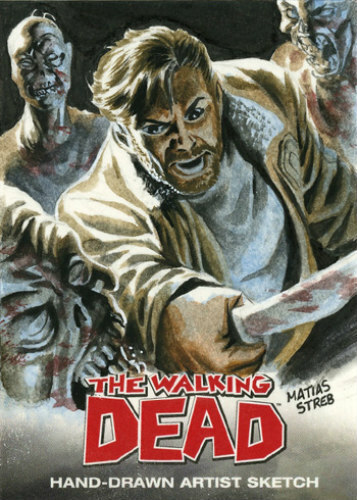 The best place to start your Walking Dead collection may also be the most obvious one; the comic books that inspired the whole craze to begin with. There are, of course, the single-issue monthly releases which offer the story as originally presented. These are easy to track down online and in comic book stores and shouldn't cost too much money on their own, although you'll be buying well over 100 issues. If you want your book shelf to look a little bit neater, you may opt for the hard cover editions which, typically, combine 12 issues into one book. As a reader, this will allow you to complete a full story arc in one sitting and, as a collector, these editions are often enhanced with exclusive content. Skybounds Omnibus editions compile 24 issues into one place, giving you two full story arcs. 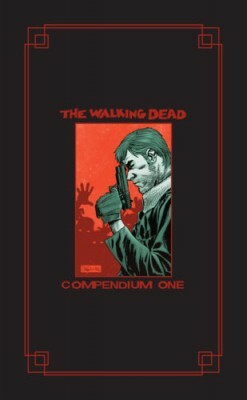 If that isn't streamlined enough for your tastes, you can collect the Compendium books that include 48 editions of the comic book as well as alternate covers. Finally, there is a new, giant-sized book of artist proofs that should be essential to fans of the comic book. The 11x17 book is not meant for bookshelves or comic cases and shows off the stunning art work of the comic book series, minus the gray tones. The size of these books prevents them from getting the Omnibus treatment and it's not clear with how many issues they intend to give this treatment to, but if you are interested in raw comic book art, these are beautiful additions to your collection. Trading cards for both the television show and the comic book are distributed by Cryptozoic. 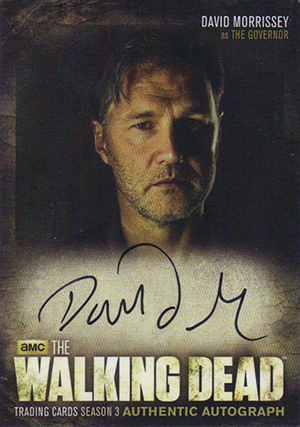 The sets based on the television series also include autographs from cast members as well as costume relic cards and sketch cards. Because the nature of the show has characters being killed at a steady and random pace, the value of autograph and relic cards can vary wildly based on the characters. The two sets based on the comic book series also include sketch cards, portraying the characters in color for the first time, as well as autograph cards signed by the creative team behind the comic series. As is to be expected from a Cryptozoic release, there are matching binders that can be purchased to house these sets and each binder comes with an exclusive card. In addition to the trading cards, there is also a TWD card game from Cryptozoic but the collectible value is minimal, at best. It is doubtful that any serious collector of comic book-based action figures and statues is without a fair amount of McFarlane product in their collection. 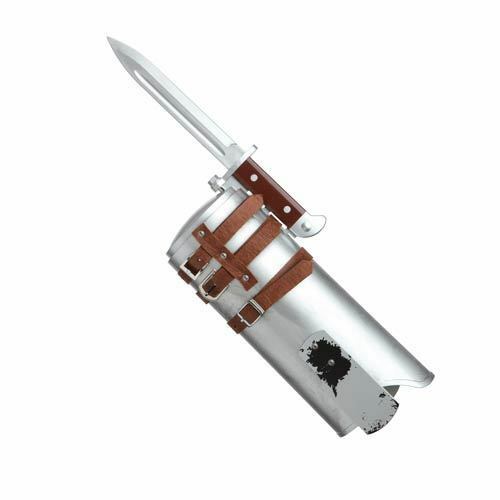 This company handles several The Walking Dead products, including a few Skybound Exclusives (Skybound is the company that releases the comic series). Unlike the smaller action figures noted below, McFarlane figures are highly detailed with realistic reproductions of the actors' faces as well as a number of accessories. As with any action figure, it is ideal to purchase one mint in box and there are plenty to choose from on eBay. Thus far, McFarlane has released eight different series of action figures devoted to the television show and four different series devoted to the comic books. There are also a handful of 10" deluxe figures with greater detail and a higher price point. Along the same lines as the action figures, although in a vastly different price range, are the resin statues released with comic imagery. These statues are exquisitely detailed and, although pricey, should be mandatory additions to any serious The Walking Dead collector. 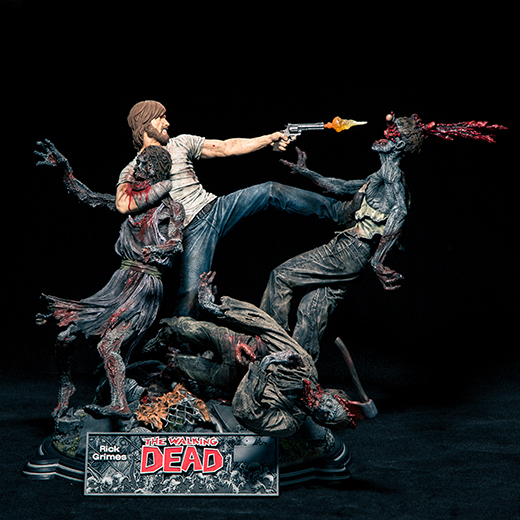 One statue portrays Rick taking on a group of walkers while the second portrays Michonne yielding her katana sword to take down a pair of walkers. These incredibly detailed statues were McFarlane Collectors Club exclusives, so your only option of purchase at this point is through the secondary market. The latest addition to the McFarlane offerings are their construction sets which allow fans to build small recreations of some of the most iconic features of the television show. This includes options like the Governor's Room, complete with aquariums of human heads, the road to Terminus, and Dale's RV, which can be used in your Breaking Bad playset as well. The construction sets may not appeal to collectors for their value but for the novelty and fun of it all, these are a great addition to any collection. Gentle Giant produces some beautiful 1/4 scale figures based on the television show characters. The faces are very well produced and the detail work on these full-body figures is impressive. Although they aren't terribly difficult to track down, expect to pay several hundred dollars for them on eBay. For the collector on a more modest budget, Gentle Giant also produces mini busts that display the characters from the waist up. The quality of design is very comparable to the full length figures, but at a more reasonable price point. The busts are probably a more logical introductory item for collectors. It is fairly typical to find the busts for under $100 on eBay, but that is not always the case, so collectors should jump on the good deals when they come across them. Finally we get to Funko and their extensive line of Walking Dead collectibles. It is very likely that Funko has added several products to their line in the time it took you to read this sentence, so it's advisable to read the individual pages right here on the site. Funko has released six series in their popular Funko Pop line alone, accounting for over 60 figures. Beyond that, they have released three sets of Mystery Minis (1, 2, 3), a set of Vinyl Idolz (Daryl, Michonne, and Rick), a set of Dorbz, a set of Wacky Wobblers bobbleheads, and a single Fabrikation figure, bringing the total number of figures to over 120 and rising. Funko figures are fun to collect and easy to track down in comic book stores, major box retailers, or online. While these may not mature in value or scarcity any time soon, they're still a great addition to your collection. MiniMates WALKING DEAD Series 4 Complete Set "ALICE, BRUCE, GOVERNOR & ZOMBIES"
MiniMates WALKING DEAD Series 1 "GUTS & BURNED ZOMBIE & DALE & FEMALE ZOMBIE"
Bulls-i-Toys has three product lines with The Walking Dead licenses: Dog tags, Chibis, and wind-ups. 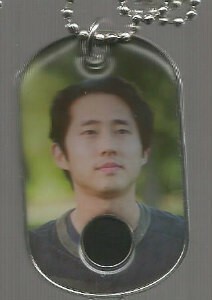 The dog tag series are, as the name implies, dog tags with character photos from the television show on the front. There are foil alternates in this set and relic tags that include a small swatch of costume fabric used in the program. The relic dog tags are fairly popular and often sell for a fair amount if the the image and relic are from a character's final season. Chibis are small figurine toys sold in blind packaging which, in the case of Walking Dead, only bear a basic resemblance to their real life counterparts. These toys are probably only of interest to younger fans or die-hard collectors of figurines. It is very easy to assemble a complete collection on eBay for a fraction of what you'd pay purchasing individual packs or hobby boxes. Lastly, the Wind-Ups are self-moving wind up toys with very similar designs to the Chibis line. Again, these should be considered toys, at worst, and very low, entry-level collectibles, at best. Probably because of their packaging, which is not blind, there is a fair amount of after-market reselling online and complete sets are very easy to assemble but may come at a higher price than a full set of Chibis. The folks over at Think Geek have designed a set of replica weapons promoted as "role play weapons." While these are set at a very reasonable price point and may appear to be plastic children's toys, their detail work is actually pretty solid and offer a cheap, but fun, addition to any Walking Dead collection. 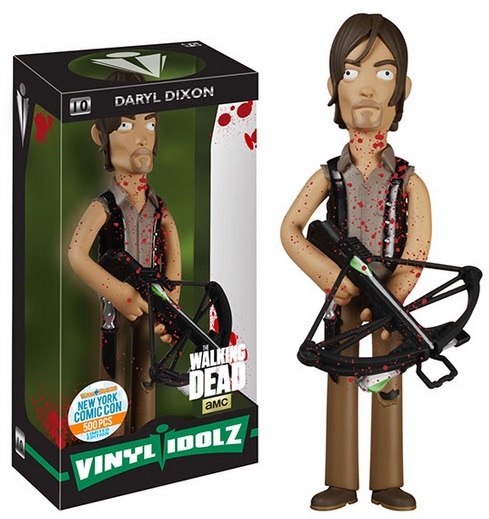 Weapons included are Merle's Knife Hand, Michonne's Katana, and Daryl's crossbow. All three weapons appear on eBay fairly regularly and with inflated asking prices, but the products rarely sell for much more than retail value ($25 to $35). With the show's popularity as strong as it ever has been, including a recent spin-off, and the comic book series still going strong, there is likely to be a whole host of new collectibles for The Walking Dead to add to this list in the coming years. As stated at the top of this article, there are also hundreds of other trinkets and chachkies that are adorned with Walking Dead imagery and, of course, you can collect the many special edition comic collections available.